The Lombardy region is well connected by railway and many of the cities and towns around Lake Como have their own railway station. Travelling to Lake Como by train like the aristocrats of the 19th century is definitely a possibility and will take you through the wonderful landscapes of northern Italy. If you arrive from the north, you will also get to experience the unique Alpine environment. Here are a few examples of railway stations in Lombardy that might be of interest for the prospective Lake Como tourist. They are all owned by Rete Ferroviaria Italiana (RFI), which in turn is owned by the Italian state. Further down on this page, you will find a list of railway stations in Lombardy that are instead owned by the private company Ferrovienord S.p.A. 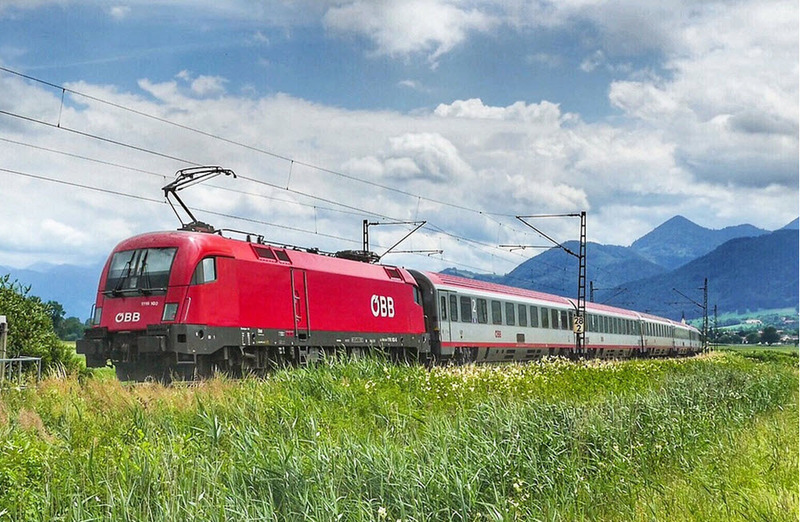 This is a transport company that manages a network of regional railway concessions in northern Italy. As you can see below, the RFI railway stations are divided into the categories platinum, gold, silver and bronze. The platinum and gold railway stations are well connected to international lines and lines from southern Italy. Silver stations and bronze stations are more likely to come in handy when you want to reach smaller towns and villages throughout Lombardy, including small settlements around Lake Como. A lot of international train travellers arrive to one of the major railway stations in Milan where they change to one of the regional trains to take them into the Lombardian countryside and the picturesque Lake Como area. It is also possible for international travellers to take a route from Switzerland and directly into the Lake Como landscape, without bothering with Milan. Como is the main city along Lake Como’s southwestern branch, so if you want to explore this branch of the lake, taking the train to Como is a good start. Como is located at the southernmost tip of the lake’s southwestern branch. From Como, public boat transport is available on the lake. Taking the train to Lecco is a good idea if you want to explore Lake Como’s southeastern branch, since Lecco is situated at the southern tip of this branch. For those interested in Lake Como’s northern branch, Colico is a good starting point and home to several railway stations. Colico is situated near the northern end of the lake’s northern branch. From Colico, you can use public boat transport to explore the lake. Bellano is a small town situated on the lake’s northern branch, but not very far north of the place where the northern branch splits into the southwestern and the southeastern branches. Bellano is on the eastern shore, with Menaggio almost straight across on the western shore. When you are in Bellano, you are not very far from Bellagio, the famous town located where the lake “splits”. Mandello del Lario is situated on the eastern shore of the lake’s southeastern branch, approximately halfway between Lecco and the part where the lake “splits”. In Italy, railway stations in the platinum category have over 6,000 passengers a day. They are major interchanges and served by high speed/long distance lines. At the time of writing, there are 16 platinum stations in Italy and two of them are in Lombardy. Italian railway stations in the gold category have high traffic levels, but not as high as the Platinum stations. In this category, you find many of the major urban inter-changes and stations serving large towns. This category chiefly contains small to medium-sized stations used by metropolitan and regional lines. Some might have long distance service, but most do not. These are small stations with low passenger numbers. In this category, you mostly find stations used by regional train services in Lombardy.